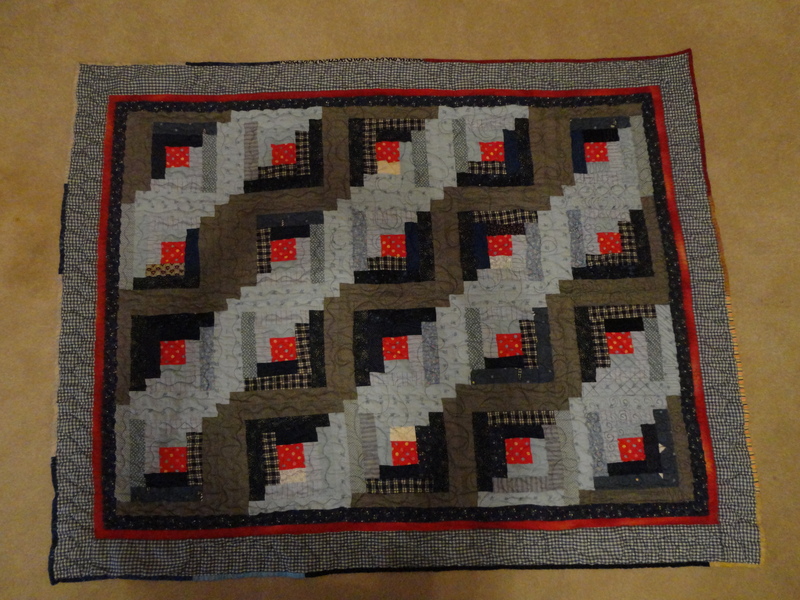 This is my annual donation quilt – the Y-Flyer Nationals quilt. My husband, Kevin, and I have sailed Y-Flyers for over 30 years. Every year the nationals regatta is held at a local sailing club. Hosting the nationals is expensive and this is my way of giving back. 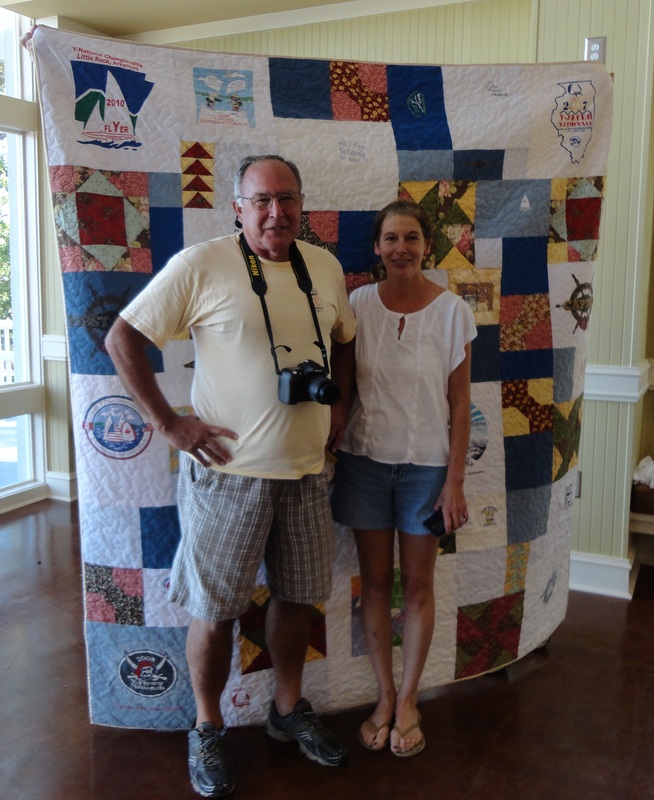 I make a quilt and tickets are sold, the money raised goes toward the club hosting the nationals to help offset the cost. This year we raised $325. 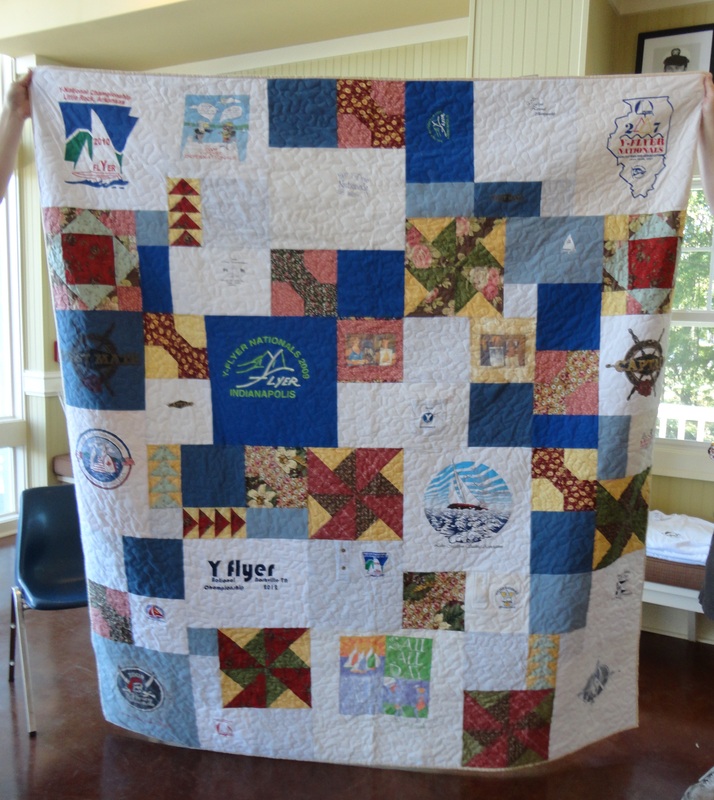 The quilt was made from prior years nationals and internationals t-shirts (with a few traditional quilt blocks thrown in). The winning ticket was drawn at the Beers Memorial Regatta in Atlanta, GA, with Buz Benzur as the winner. As you know, I recently purchased a new quilting machine. Totally awesome! Well, it takes some time to get used to the new machine … so practice practice practice. I pulled a quilt top out of my stash and set about doing just that. My sister calls it ‘sew like the wind!’ I must say, I purchased this quilt top off eBay for about $10, pulled some batting and black solid fabric from my stash and set about to quilt it. I tried starting and stopping, pantograph designs, free hand designs, and using templates and rulers. Great fun! And tons of experience. 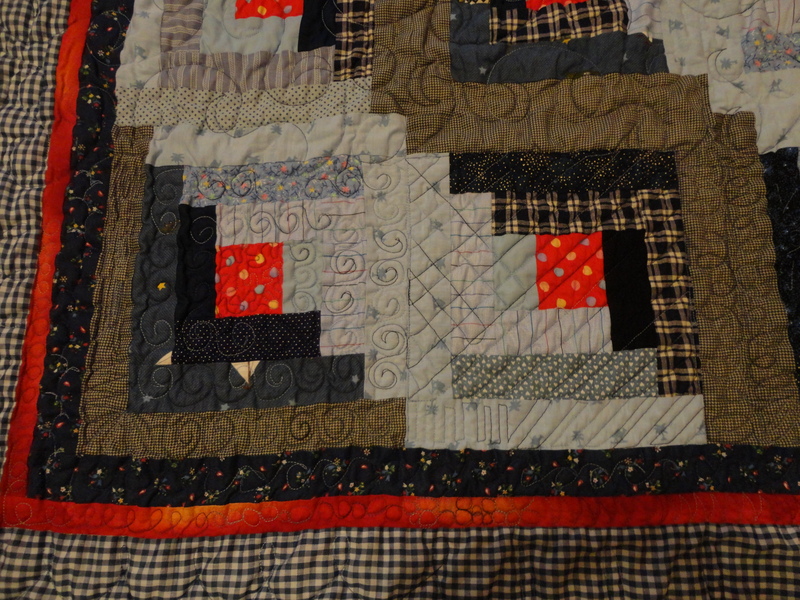 The quilt is not exactly what I’d enter into a quilt show, but as for snuggling under while watching tv – perfect! Alright, I get it, some sewing projects are not as exciting as others. But then again, it depends on who you are. I have a favorite tote bag that I carry to work every day – carries my planner, journal, coffee, umbrella, cell phone charger cord, small tablet of paper and a pencil (I write notes to myself), shoes (I wear my running shoes from the parking lot to the office), and other miscellaneous stuff that girls carry. So what do you do when your tote bag doesn’t have pockets? Add them yourself! I got this idea off a Martha Stewart (don’t ya just love her?!) website. I went to Home Depot (shameless plug for one of my favorite stores) and bought a 77 cent apron, cut the ties off it, and sewed it into the tote bag. Perfect! Well, Martha Stewart said to use the ties to make bows to put around the tote bag handles so you can move the pockets from one bag to another. Well, I’m not much of bow-kind-of-girl so I just sewed the darn thing in there. If my other favorite tote bag needs pockets, I’ll buy another apron. 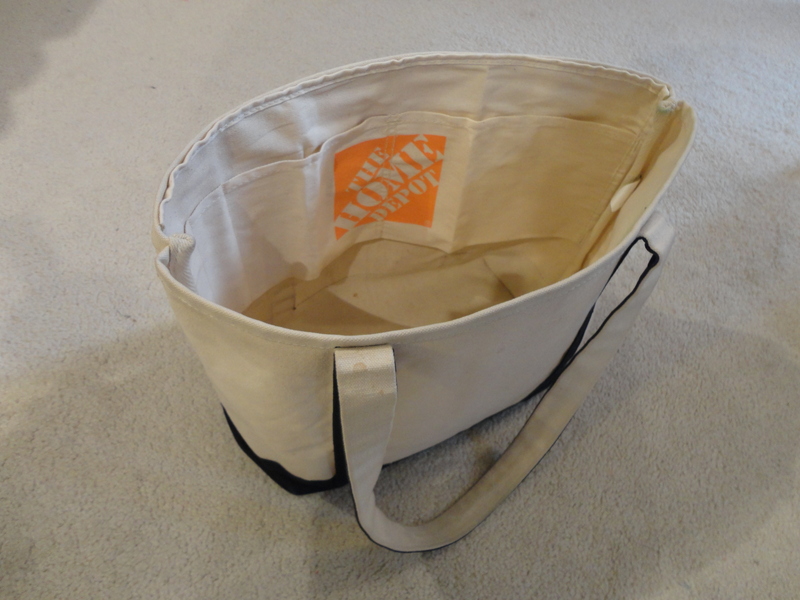 So, a little advertisement for Home Depot, but let me tell you – these tote bag pockets are handy as a pocket on a shirt. Pun intended. I’ve been working on several projects, so let’s catch up. 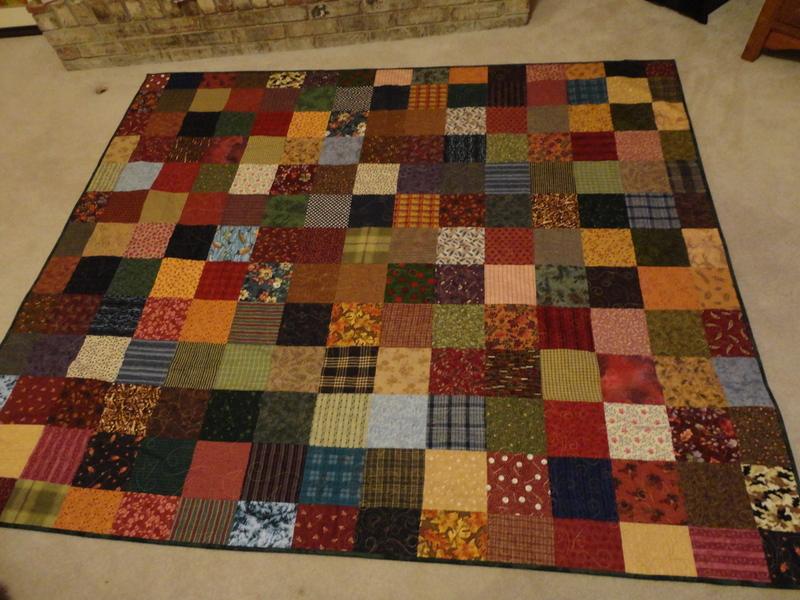 This is a queen size quilt that’s made of flannel squares. That may not sound too amazing, but this is something I pulled from my UFO’s (Un Finished Objects). When I pulled it out of the box, it was pieced and layered with a piece of white flannel as the batting and a red/black plaid flannel as the backing. Three layers of flannel – thin but very warm! So when did I piece it and layer it? One of the mysteries of the world. Ah, but there was a catch, it didn’t line up correctly. The batting and backing weren’t quite the same size as the top. So, do I un-layer it and line it up correctly and add in pieces to make the backing the same size as the top? No way! 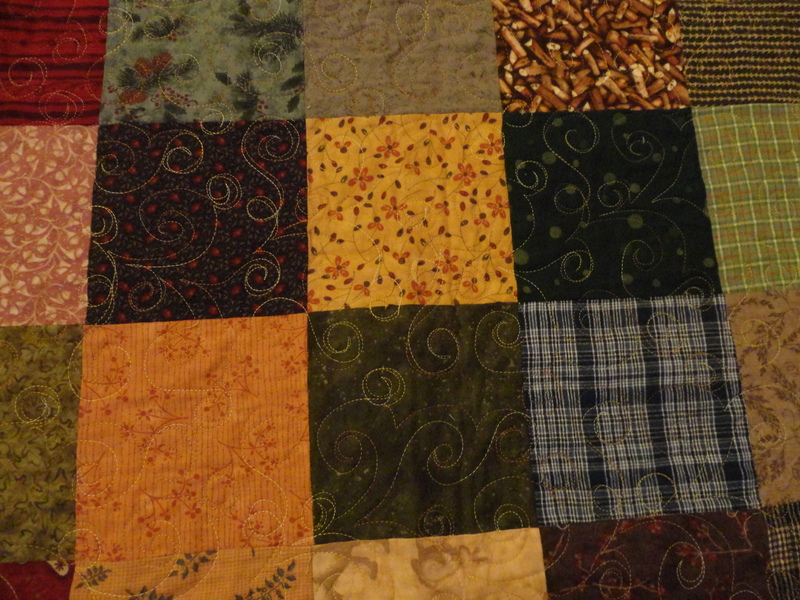 Cut off 3″ from each side and quilt it! The thing about UFO’s – get them done and move on. So I put it on the quilt frame and quilted a beautiful swirl design in gold thread. That really added movement to the squares of flannel. This is currently on our bed and let me tell you – that sucker is heavier and warmer than it looks! And my husband loves it! For those of you keeping track, this is week 22 of my 52 week challenge. And just to think about it, I may start that 52 week challenge again next year – but better prepared!